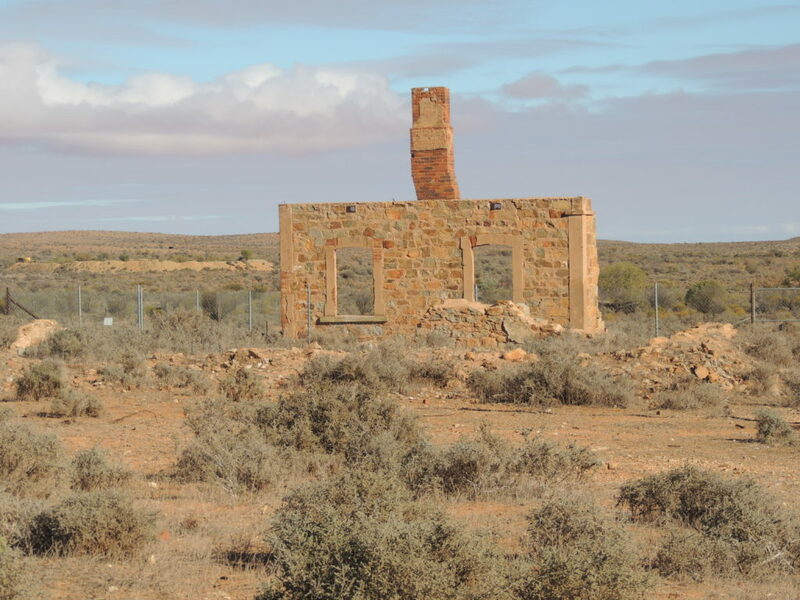 Only 26 km from Broken Hill is the historic almost-ghost town of Silverton. Its origins also lie in the silver mining industry and in fact, silver was discovered there first. In 1885, 3000 people lived there. Now there are 50, mostly artists and people who cater to the tourist trade. 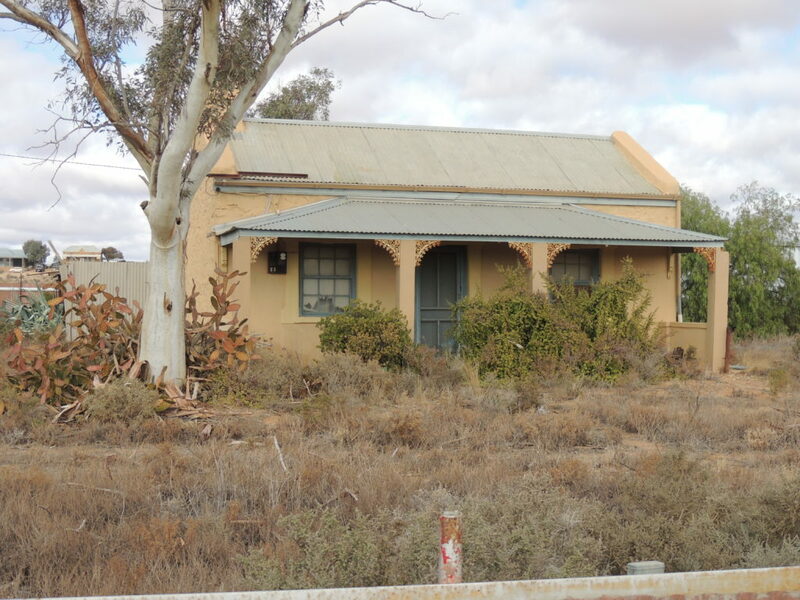 When the mines became established at Broken Hill, Silverton slowly fell into decline, and indeed, some of its houses were moved to the larger town by train or teams of donkeys, camels or bullocks. Those that remained fell into disrepair, so that now there’s a cluster of only the most tenacious left. It’s an interesting place to wander around, and there are some quirky characters living there. The streets, or what’s left of them are extremely wide, and an occasional vehicle disturbs the dust which billows around in eddies and whorls. A couple of stray donkeys slowly amble along looking for a handout, but they won’t let you pat them, eyeing you suspiciously as they keep just one step ahead. The riverbed is completely dry with powdery red dirt imprinted with the easily recognisable marks of passing kangaroos, and bluebush plains stretch as far as the eye can see. In the winter, the season of our visit, a keen wind wraps itself around sightseers. The visitor to Silverton can enter any of several galleries or the local cafe, or simply ramble around the streets. St Carthage Catholic church is now privately owned by artists and is in remarkably good condition, and the old Silverton Gaol contains a museum full of memorabilia. And look, there’s a garden! 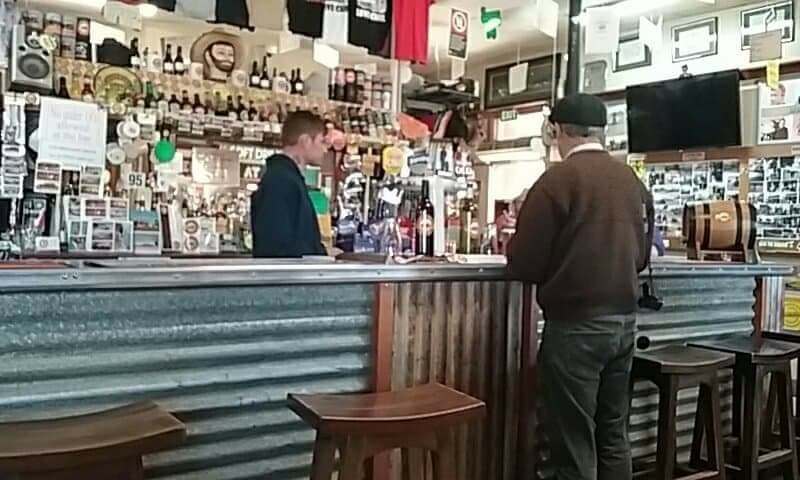 The café owner tells me how difficult it is to have a garden here, even though they’re on town water (from Broken Hill) and how she carries water from the shower or the washing up to give a small amount to her plants, just enough to keep them going. She has planted only things that are particularly hardy and they look as though they’re doing well. There are a lot of eccentric additions and a barking dog to keep people from getting too close. Manicured lawns won’t survive here, nor frothy flowers or clipped hedges.. 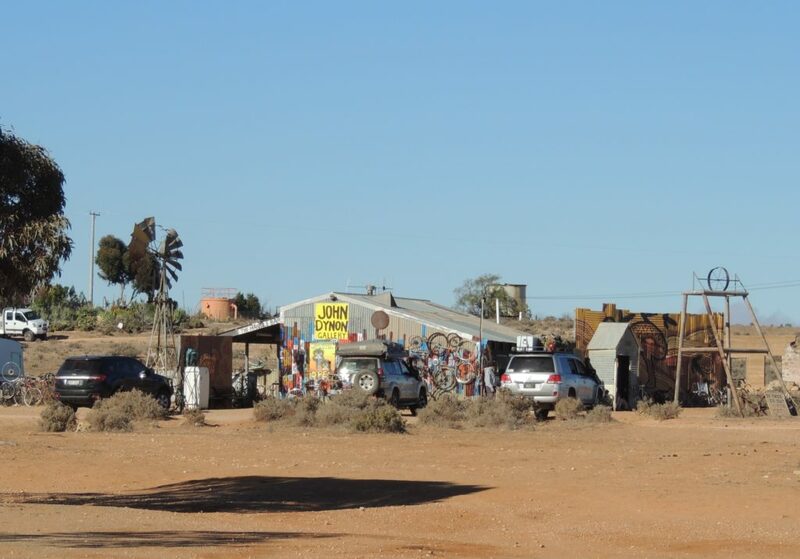 The hub of the town is the Silverton Hotel which was used in the making of the movie ‘Mad Max’. In fact, quite a lot of movies have been made in Silverton: ‘Wake in Fright’, ‘A Town Like Alice’ and ‘Razorback’, to name a few. We had a beer there, just to say we had. Previous Post National Tree Day. So interesting to see your photos of Silverton. I’ve read a little about it but usually the same old photo gets trotted out with each piece. It was great to be introduced to so much more via your blog-post. 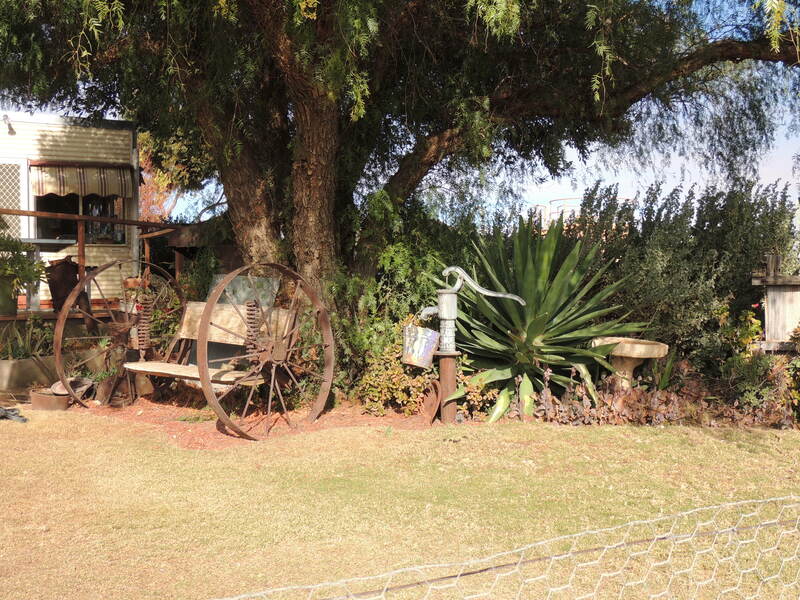 And an outback garden! I was delighted! Thanks so much Liz. I had to admire the gardener as it wouldn’t be at all easy. Careful choice of plants is the key, I think. Really interesting post and appreciate you shared your adventure with us Jane. I only have stopped Broken Hill (station) in the morning in a route of Indian Pacific. I would even not know of Silverton unless you introduced. Thank you! Thank you Makiko, I’m glad you enjoyed the post. 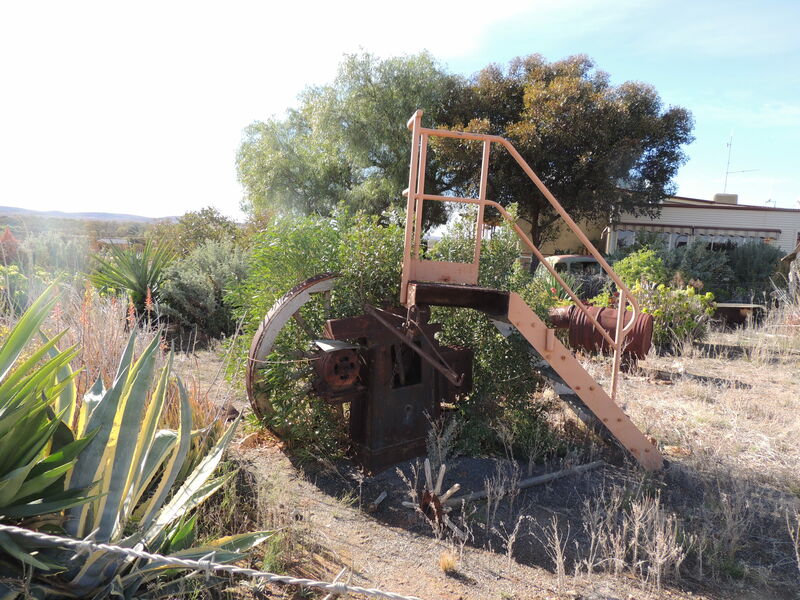 The Broken Hill area is worth a longer visit, one day, if you have time. A different world indeed! I have great admiration for that intrepid gardener (and I love the use of the rusted truck as a background). I tote water from the shower and the kitchen to my garden too but I hope never to face a climate or landscape that challenging! I was full of admiration too, Kris. We put our shower water on the garden too, but I wouldn’t like it to be my only source! That would make gardening very hard. What a place, where imagination conjures up the movies you mention Jane. In that desolation, a resilient garden – that speaks of human tenacity! It does Liz- and plant tenacity too! As a Californian now living in the south of France, I was immediately reminded of the Old West ghost towns in the US. So interesting to visit. I was delighted to see an old friend, Agave attenuata, on the left in the photo with the truck. 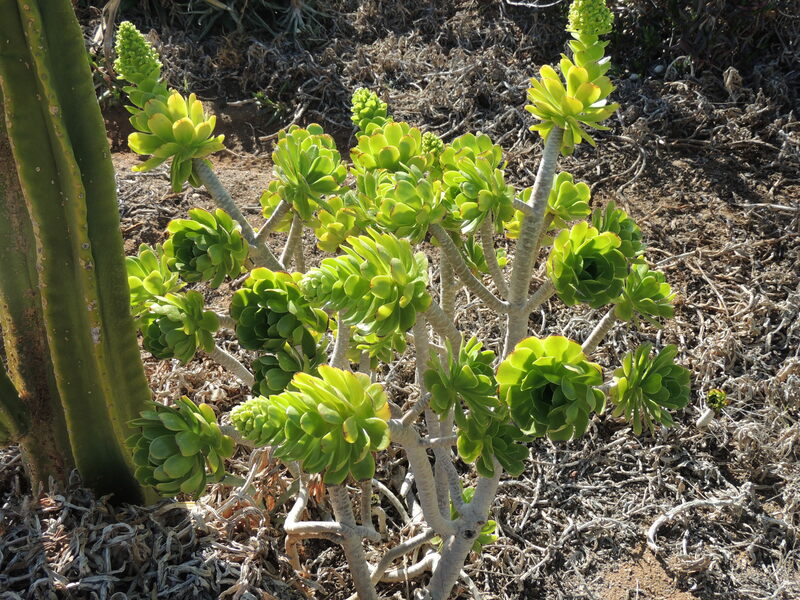 Its a native of Mexico, but grown widely in southern California, where I had them in my native plant garden. I bet that garden has some California natives, which are adapted to very dry and hot conditions in many cases. Thanks for the vision of an Australian ghost town! Thank you for your comments, Bonnie. I agree, there would most likely be other parts from California in that garden. The way we are going here with lack of rain, I’ll have to be planting some in my garden as well! Thanks for identifying the Agave attenuata. Ghost towns are so interesting, and I feel like they truly are occupied by the “spirits” of the ancient inhabitants. I wonder if the people who live there now feel it, or just get used to it. I think they’d feel it. It’s so isolated and quiet, I reckon those spirits would be around for sure. Thanks Pauline. I do hope you make that journey later.. it will be very interesting to read your version of it. I spent several days in Broken Hill on my first visit to Australia in 1998. I took a couple of day trips out from the town, one being to Silverton which I found fascinating even though I have never seen Mad Max. Must be an interesting group of people who make their lives there. And yes, I also had a beer in the Silverton Hotel. Was it as dry when you were there, I wonder, Jude? I’d love to see that area when there has been rain: I think it would be quite different. I was told that when they get good rain, they are quite isolated because the roads are closed. 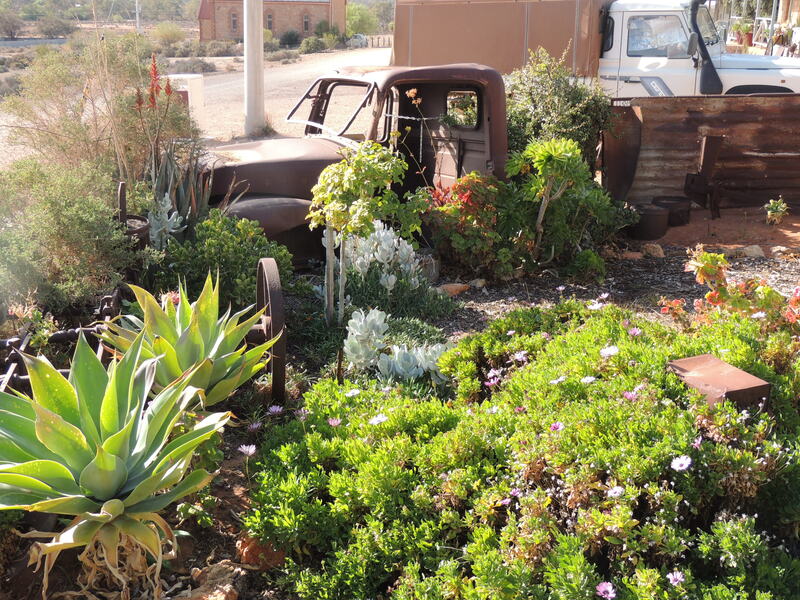 There is something very beautiful about deserts, about old rusty trucks and bright green succulents. And you got all three in. Fantastic. Thanks Jean. I, too, hope you get to experience this unique place. I can imagine how chilly the wind would have been out there. We save our shower water for the garden too, and we live in a city. It’s so dry everywhere. Some years ago on an outback 4 wheel drive we stayed in a place called Mootwingee or as it is now called Mutawintji National Park. We slept out in open. It was an amazing place. 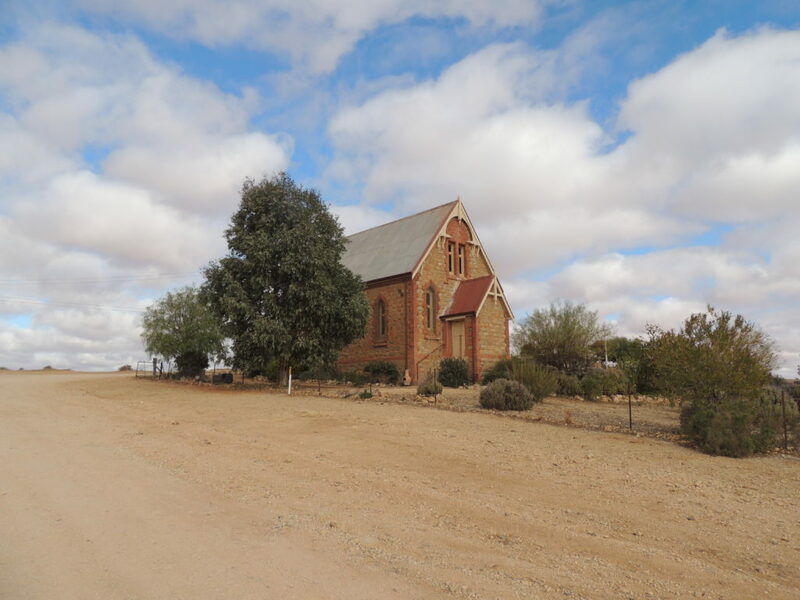 About 80 km north-east of Broken Hill. U remember being bitten by ants . They climbed up the camp-bed, using my blanket touching the ground, as a ladder. I hope they weren’t those black ants, Gerard. They have a very painful bite. The cafe owner has done very well indeed with her garden. You have to admire anyone who even attempts a garden in such a barren landscape. Love the little church and even, the small house. Sounds like an interesting place to visit (if you’re in the area).